Grease two 3 inch x 5 inch mini loaf pans. Put all the ingredients in a food processor or blender and process until smooth. Take 2 loaf pans and divide the batter equally between them. Bake for 25 minutes, check with toothpick to make sure it is fully baked. For the best results, try using two 3 inch x 5 inch mini loaf pans as opposed to 1 regular loaf pan. The overall moisture and flavor is really good using 2. You can use any nut butter you would like (cashew, sunflower, etc), just make sure it is creamy. I love to use stevia or monk fruit…but if you aren’t trying to go low-carb you can use honey or maple syrup. This bread is great topped with grass-fed butter, ghee or coconut oil and a sprinkle of cinnamon! Bread is a modern day comfort food but also one of the most inflammatory foods you can consume. This is due to the high carbohydrate content that alters our blood sugar and stimulates inflammatory mechanisms. 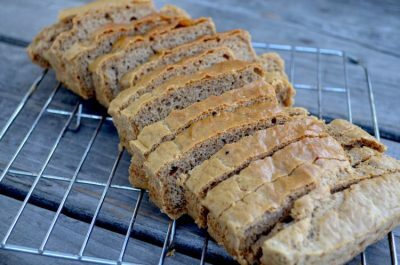 This is a fantastic, grain-free, low-carb, ketogenic bread recipe that is easy to make and your family will love will the texture and flavor! 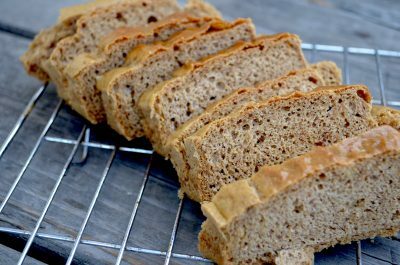 We have gotten rave reviews about our coconut flour bread and almond flour bread recipes but we also had some people asking about a flour-free recipe. So we decided to try this out and it worked great. I love using the MaraNatha coconut almond butter which is a combination of coconut butter and almond butter. It tastes great and you get the benefit of the medium chain fats within the coconut butter and the long-chain fats in the almond butter. Both coconut and almond butter also provide a lot of good fiber. The overall recipe makes a high fat count, about 80% of calories, moderate protein (about 15% of calories) and very low carbohydrate count (about 5% of calories). This is within the ideal ratio for a ketogenic diet, making this perfect for someone trying to reduce inflammation and get into ketosis. To add in more anti-oxidants, consider putting 1 tsp of ground cinnamon in the recipe or sprinkling it on top of a coconut oil or grass-fed butter spread that you put on the bread.